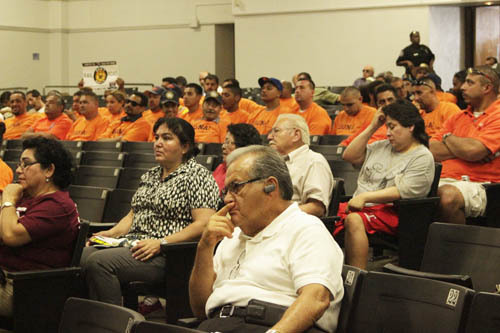 At a meeting in East Los Angeles Saturday, resident after resident voiced concern that a “plague” of pollution and health issues could rain down on their predominately Latino neighborhoods if they are forced to endure more light rail construction. Their comments came during a public hearing at Griffith Middle School on Metro’s draft environmental report and study on alternatives for closing the gap between the Long Beach (710) and Pasadena (210) freeways. Earlier that week, Martha Hernandez attended a meeting at Centro Maravilla in East L.A. with USC-Medical Center doctors who explained the substantial health risks tied to pollution. “We were told air pollution causes asthma, diabetes, autism, and other illnesses,” she told EGP in Spanish. Like Congresswoman Lucille Roybal-Allard, many people at the meeting believe they are the victims of environmental racism and injustice, and were given little say on a project that could tear up their community. “I’ve had enough of those who want to continue taking advantage of East L.A. because we are Latinos,” said Carmen Gonzalez, who lives near Mednik and Third Street, where a light rail station would be built if this option is selected. Speakers said past transportation projects have already left them exposed to high levels of toxic pollution. “I have asthma and it’s harder for me to play football,” said Garfield High School student Timothy Williams. “Think about the health of our children, emissions affect our community,” another speaker said. “Air quality hasn’t been studied yet” but should be before anything is decided, said eastside resident Lili Hernandez. Living in an area with high levels of traffic pollution can lead to serious illnesses, according to a recent infographic, Living Near Busy Roads or Traffic Pollution, shared by the USC Environmental Health Center. The infographic shows that women who are pregnant are at greater risk of developing high blood pressure, giving birth to low-weight and/or premature babies, who in turn have higher levels of behavior or learning problems and autism; smaller lungs, asthma, ear, nose, throat infections and obesity. In adults, long-term exposure to pollution can lead to higher levels of heart disease, stroke, lung problems, memory loss and a shorter life span, the report found. “We have schools, parks, the senior apartments and businesses” close to where they want to build the light rail, and there’s no doubt that’s harmful, Gonzalez told EGP in Spanish. Before the meeting started, stakeholders were able to review maps and other documents pertaining to the five alternatives under consideration in the Draft EIR. They also had the chance to grill Metro staff about the plans. One group of women directed their frustration at a Metro representative, questioning him about a now retired Metro employee’s assertion that metal scrapings from the elevated train – two stories high in some sections – would be released into the air and breathed in by unsuspecting residents. The East Los Angeles Chamber of Commerce is actively fighting the light rail option, which they say will do nothing to relieve traffic on the 710 Freeway but will disrupt life on the eastside. The business group says a tunnel connecting the 710 to the 210 Freeway is a better solution for traffic reduction that will not be as harmful to the East L.A. community. “It will improve the flow of traffic and decrease traffic on surface streets north of Valley Boulevard, therefore reducing pollution in our local communities,” the Chamber states. 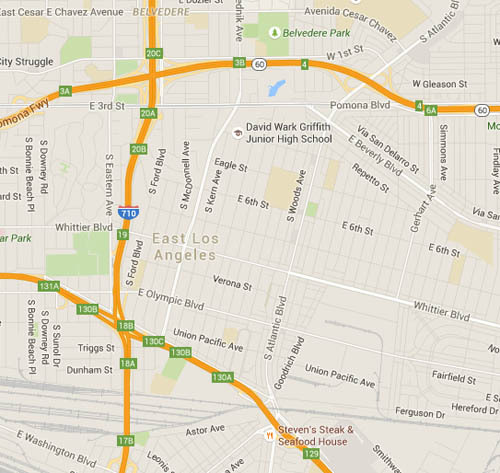 A little further south on the 710 corridor is the City of Commerce. The city’s residents on a daily basis experience the impact of diesel exhaust from the nearly 47,000 trucks that travel the 710 freeway everyday, and as many as 1,000 trucks an hour on the city’s main streets. The daily exposure to high levels of exhaust causing pollution has raised Commerce residents’ risk for cancer, asthma and other respiratory illnesses. Last October, Commerce approved a resolution strongly supporting the effort to close the 4.5-mile gap “as soon as possible.” City officials believe completion of the freeway will alleviate traffic in local neighborhoods, generate economic development and create jobs in the region. On Tuesday, Commerce unveiled one of the 20 the new “No Idling” signs that will be placed throughout the city targeting truck drivers who leave their engines running while stopped in the city. Mayor Lilia Leon calls closing the 710 a much-needed regional effort to improve transportation. “Because there is not a connector, everybody ends up in Commerce,” Leon said. “If there was one, probably they would keep going on the 710,” she told EGP. “I’m sure it will alleviate the traffic flow,” she said. Councilman Jose Huizar (CD14), who represents El Sereno, an L.A. neighborhood that has for decades been at the forefront of efforts to block the 710 expansions, disagrees. On his website he states that he strongly opposes the 710 freeway expansion and believes a “multi-modal approach” — which could includes things like street light synchronization and dedicated bus lanes — is the better alternative to alleviate traffic. “I oppose any option that disrupts the community of El Sereno or brings additional traffic to the area. The five alternatives in the Draft 710 EIR fall woefully short in my opinion,” Huizar told EGP via email. “Working with local stakeholders and community groups, my office has begun the process of asking El Sereno and the surrounding communities a question that no one has asked them up until now: What do they want? What traffic improvements can we make locally that help, serve and advance the community of El Sereno?” Huizar said. The councilman hosted a meeting on the SR-710 alternatives in El Sereno last week, which according to his spokesperson Rick Coca was “well-attended.” The “focus was entirely on truly listening to local residents to get their feedback – something that has been lacking in this process,” said Coca. If the light rail train is constructed, 15 businesses will have to be moved and the new East LA Civic Center Plaza would be replaced with a train station. About 155 employees would lose their jobs according to the website East LA Against Injustice and Racism. Nueva Maravilla Public Housing and Kipp Raices Charter School—which will open in the fall—could also be taken. Several residents told Metro that more studies and health assessments must be made before they reach a decision. In the past “People proposed a lot of ideas that were ignored said East L.A. resident Luis Garcia. The deadline to submit comments has been extended until August 5th. The document can be viewed at the Caltrans District Office, 100 S. Main St., Los Angeles, CA 90012.